Singularity (Sisi) is a public test server for EVE Online that is used by both CCP developers and EVE players to test changes and new features before they are released to the Tranquility server. Test servers have a very strict set of rules. Its primary function is to provide a test environment as close as possible to the live environment of Tranquility. For this purpose, the Tranquility database is "mirrored" (copied) over to the Singularity server once every few months (or more often, if needed by the CCP Quality Assurance department). For testing the performance of the server and client with many players at the same place (especially fleet-fights) there are periodical mass testing events. Hint: Please keep in mind that most new features on the server are still in development and not set in stone. They will most likely be changed and tweaked further. If you find bugs please report them. If you have more feedback please post it in the Test Server Feedback Forum. 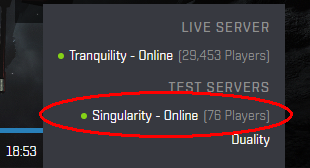 In order to access the Singularity server you need to have an account on Tranquility. The account needs to have been created before the time when the current mirror was taken. The account state will be the same as it was when the mirror was taken. Just select "Singularity" in the server drop-down menu and then login with your account. Everything else (creating and patching of the client) is done by the launcher. You can copy your client settings through "manage profiles" in the launcher, if you want to do so. There is an ingame channel named Singularity where players on the test server exchange information. You may also find volunteers and developers there. The local-channel of M-OEE8 is also a good location for finding other players, volunteers and developers. If you want to be moved to M-OEE8 or some other destination, type /moveme into any chat channel. More details and several other commands can be found at Singularity player commands. For several issues (like requests for account reactivation) it is also a good idea to check the Test Server Feedback Forum. There you can also discuss new changes on the test server or possible problems. The Singularity server runs on a multi-node server cluster, similar to TQ, but with lower numbers. The number of nodes may vary, as the development team will add or remove hardware resources from the cluster depending on testing requirements. The process of "mirroring" consists of taking an exact copy of the Tranquility database, including character and account data, like a snapshot. This copy is then processed by the CCP Deployment team and all starbases are removed, in order to prevent players from spying on their positions and then using this information on the live server. Basic moon minerals are available in all moons, to help testing and prevent moon scouting on the test server. All accounts are edited so they don't expire. Agent memory (both standing and loyalty points) are removed. S&I jobs are removed (because jobs in starbases would get stuck). All fitting of structures like Citadels is deleted and the assets of structures in W-space is moved to 6-CZ49 into asset safety. The market is seeded so that all market items cost 100 ISK and are in plentiful supply. At least one station per constellation is market seeded like this. In addition there are some other internal adjustments. This entire process can take up to 3 days, then the Singularity server is open for public. After a mirroring process, the Tranquility and Singularity databases are separate and distinct and no synchronization between them will occur until the next mirror is taken from Tranquility and deployed on Singularity. Character progression on Singularity will be independent of Tranquility - players can effectively train two different sets of skills on the same character, if they so wish. Actions taken on the Singularity server will not affect your account or character on the Tranquility server.